EXPOSITION OF THE BLESSED SACRAMENT will take place every Wednesday after Mass. Fr. 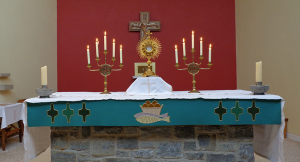 Mark will expose the Blessed Sacrament at 10.30am and if he is unavailable, asks for an Extra-Ordinary Minister of the Eucharist to be present to repose it at 11am.